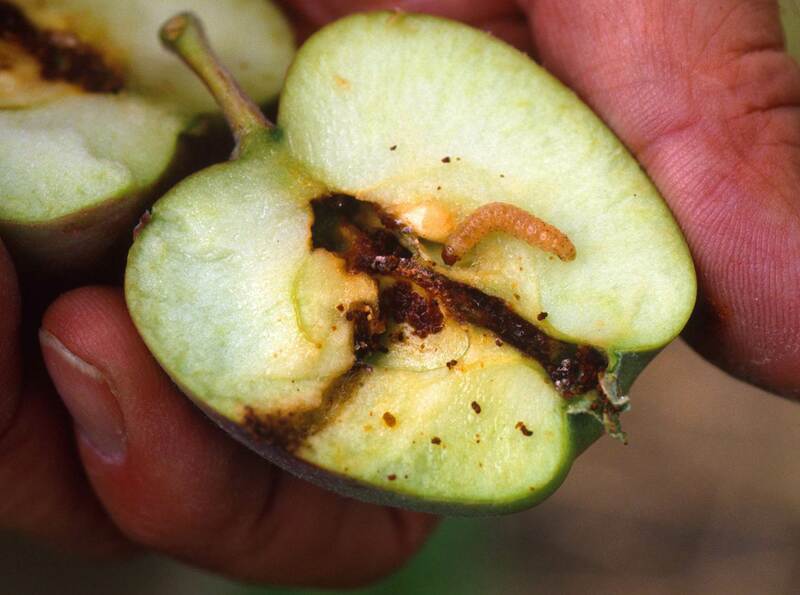 Apple scab is caused by a fungus Venturia inaqualis, which overwinters in infected leaves on the orchard floor. Mating among different strains of the fungus occurs shortly after leaf fall and spores develop in the fallen leaves during the winter. Spring rains cause spores to be forcibly discharged. Spores continue to mature and are discharged over a period of 5-9 weeks. If the surface of apple tissue is wet and temperatures are suitable, the spores germinate and penetrate the cuticle and outer layers of the plant, causing an infection. The fungus grows beneath the cuticle and eventually ruptures it and forms dark green lesions. Masses of spores are produced asexually within the lesions and become detached during rain. Water splashes and redistributes these spores, causing secondary infections. Each leaf scab lesion is capable of producing 50,000-100,000 spores. Assuming 50,000 leaves per tree have 2% scab infection, about 50 million spores would be present on a single tree. One spore can cause an infection. Infections early in the season can kill tissues near the fruit surface and the fruit develops unevenly as uninfected portions continue to grow. Cracks appear in the skin and flesh and the fruit may become deformed. Heavily infected fruit fall from the tree resulting in yield losses. Scab lesions on harvested apples result in a lower price for growers since the commercial tolerance for scab damage approaches zero. Authors: Holb, I. J., et al. Affiliation: Department of Plant Protection, Centre of Agricultural Sciences, Debrecen University. Title: Summer epidemics of apple scab: the relationship between measurements and their implications for the development of predictive models and threshold levels under different disease control regimes. Source: Journal of Phytopathology. 2003. 151:335-343. French apple production totals about 1.9 million tons worth approximately $750 million annually. French apple orchards are plagued with the same major pests that infest orchards worldwide: the fungal disease, apple scab, and the insect, codling moth. Both pests would seriously damage most of the apple crop in France without the dozens of pesticide sprays that are made. Title: Predation of codling moth eggs is affected by pest management practices at orchard and landscape levels. Source: Agriculture, Ecosystems and Environment. 2013. 166:86-93. Authors: Simon, S., et al. Affiliation: Unite Experimentale Gotheron, Institut National de la Recherche Agronomique. Title: Effect of codling moth management on orchard arthropods. Source: Agriculture, Ecosystems and Environment. 2007. 122:340-348. Authors: Brun, L., et al. Affiliation: INRA, UMR Pathologie Vegetale. Title: Effects of apple cultivar susceptibility to Venturia inaequalis on scab epidemics in apple orchards. Source: Crop Protection. 2008. 27:1009-1019. The Swedish government set a goal of having 20% of the total crop area grown organically by 2010. Organic fruit acreage did not make the goal and is still less than 5%. Growers fear low yields and poor quality by not using chemical pesticides in organic systems. Apple production would decline significantly in Sweden if the majority of growers gave up the use of pesticides and used organic methods. A major problem for apple growers in Sweden is apple scab. “There is a large demand for domestically grown apples in Sweden. However, approximately 85% of the apples consumed in Sweden are imported, and the percentage of imported organic apples is even higher. Organic fruit is produced on 4% of the orchard area. The estimated cost price of producing organic apples in a 5 ha orchard is €1.14 per kg, which is twice as high as for conventionally produced apples, mainly due to lower yields in organic production. Modern apple orchards have average yields of 40 ton/ha in conventional production and around 20 ton/ha in organic production. Authors: Ascard, J., et al. Affiliation: Swedish Board of Agriculture. Title: Cost price calculations for organically and conventionally grown apples in Sweden. 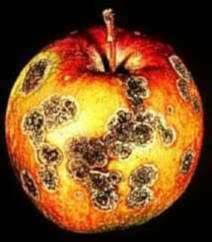 Apple scab is the most economically important disease of apples in the world. 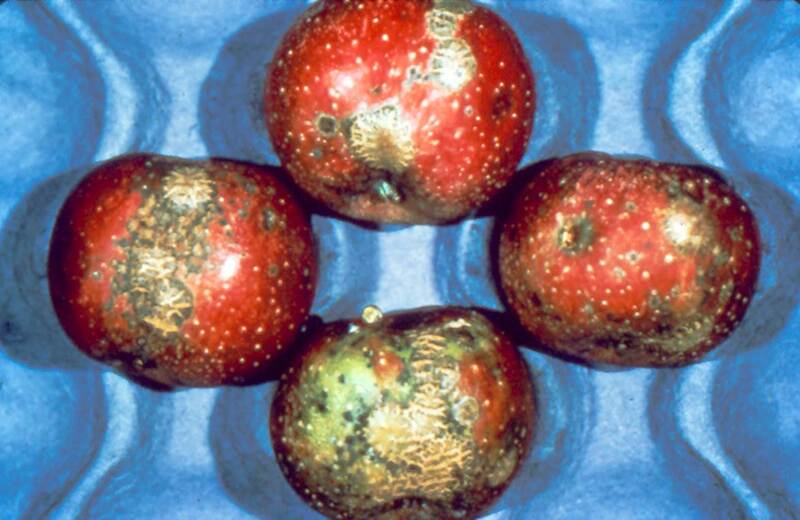 Fungal scab infections cause cracks in apples. Infected leaves fall off the tree which can result in reduced tree growth for one to three years. 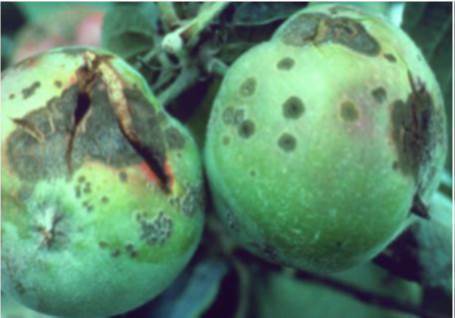 Apple growers worldwide have been spraying fungicides for over 100 years to control scab. And in New Zealand….. Affiliation: 1The New Zealand Institute for Plant & Food Research, Auckland, New Zealand; 2The New Zealand Institute for Plant & Food Research, Pukekohe, New Zealand; 3The New Zealand Institute for Plant & Food Research, Hawke’s Bay Centre, Hastings, New Zealand. Title: Sensitivity of Venturia inaequalis to myclobutanil, penconazole and dodine in relation to fungicide use in Hawke’s Bay apple orchard. Publication: New Zealand Plant Protection. 2012. 65:106-113. Organic apple production in the Eastern US is very difficult because of the presence of insects and disease pests. The moist climate is perfect for mold, rots and other fungi. Recently, a couple in New Hampshire felled their organic apple trees. They explained their reasons in an article for the Concord Monitor. Publication: New Hampshire Concord Monitor. 10 January 2010.